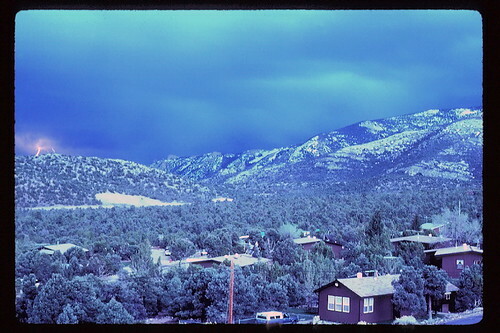 Great Basin Storm, originally uploaded by The Bacher Family. Great Basin National Park, Nevada, April 1990. I took a full roll of film to get this shot, back in the days when you didn't know what you'd actually taken a picture of till you got the photos back from the developer! I love the bluish cast caused by the long exposure under the stormy light. I could probably have gotten an even better picture, but by the time the storm got closer, I wasn't comfortable watching it from the hilltop anymore!